In early morn I walked in drizzle beneath overcast skies, my ears and eyes seeking birds. Ruby-crowned kinglets let loose with high-spirited, rollicking songs, their voices, like those of winter wrens, so much larger than their bodies. A barred owl coughed out its guttural hoots, and a belted kingfisher machine-gunned a rattling barrage of notes. Evening grosbeaks emitted muted, bubbly calls, and a hermit thrush shot shafts of exquisite sound through the forest with its ethereal, flute-like song. As is the way with birding, I heard more voices than I saw owners of those voices, the result being that my camera lay quiescent in my pocket until I looked at the gravel of our access road beneath my feet. 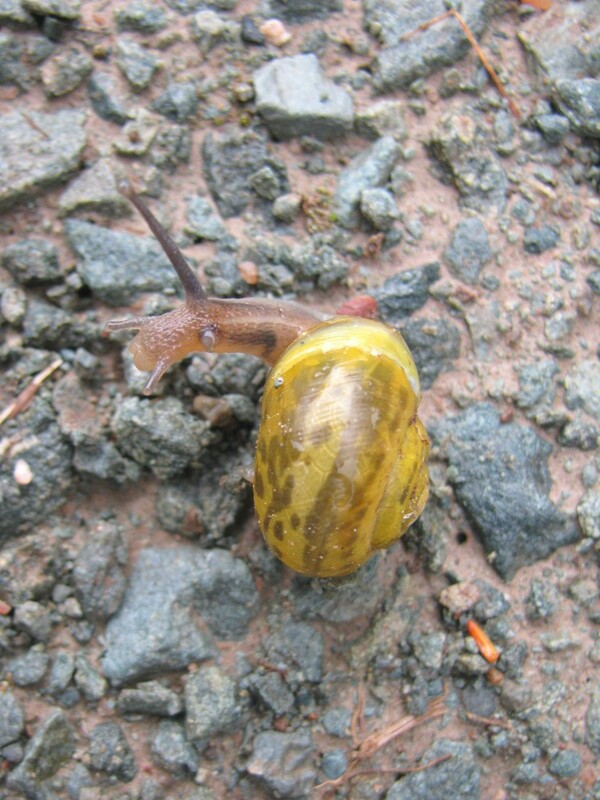 There, I spotted silent beauty slithering on mucous trails – slugs, snail, earthworms. 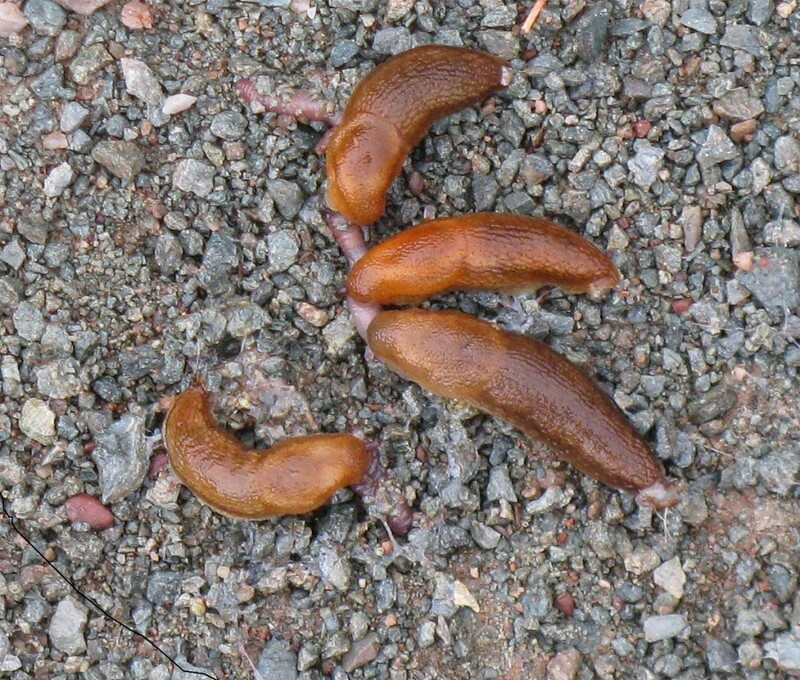 On closer observation, I noted that while some of the slugs, which I later identified as yellowish dusky slugs Arion subfuscus and blackish garden slugs Arion hortensis (I think), slid smoothly over the gravel at a slug’s pace as solitary individuals, others congregated around dead earthworms or slugs presumably run over by our car. 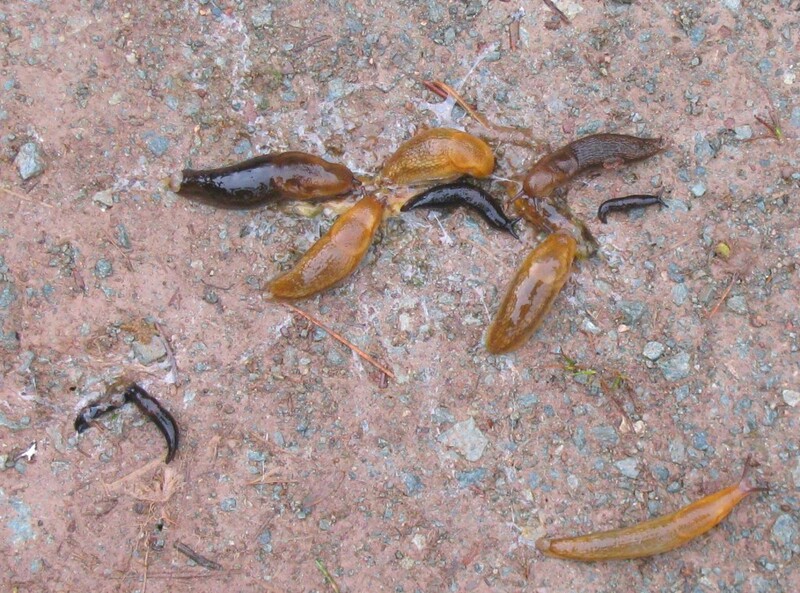 These, they appeared to be eating. 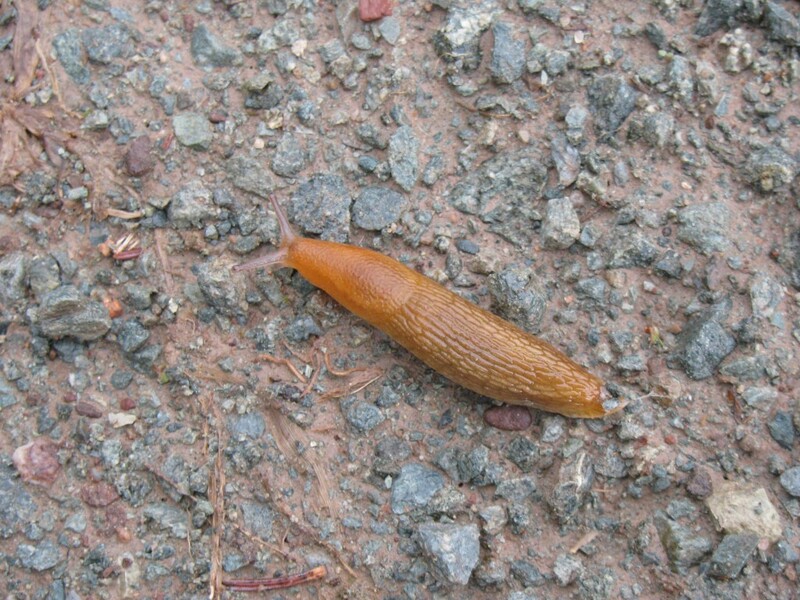 All too frequently, I’ve observed slugs in my gardens, feasting on strawberries, cabbages, or tomatoes, but this morning they showed the flesh-loving and cannabalistic side of their omnivorous habit. 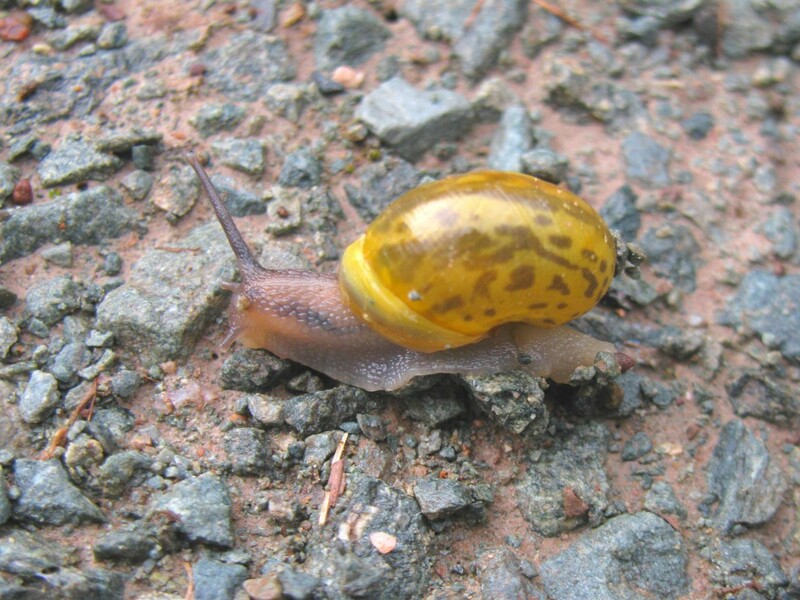 In addition to the startling number of slugs I observed on our access road, which has me concerned about the future success of my gardens, I noticed a brown hive snail, Euconulus fulvus, sliding over the gravel on the wavy carpet of its muscular foot. 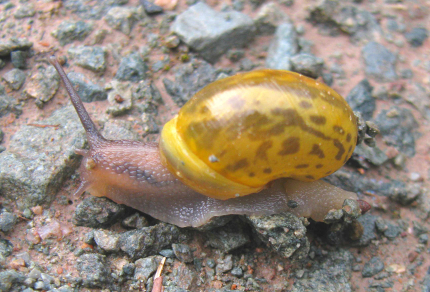 The hive snail, a shelled relative of the shell-less slugs (all members of the molluscan class Gastropoda), possessed one complete eye stalk and one partial one, the latter perhaps truncated as the result of a predatory attack. 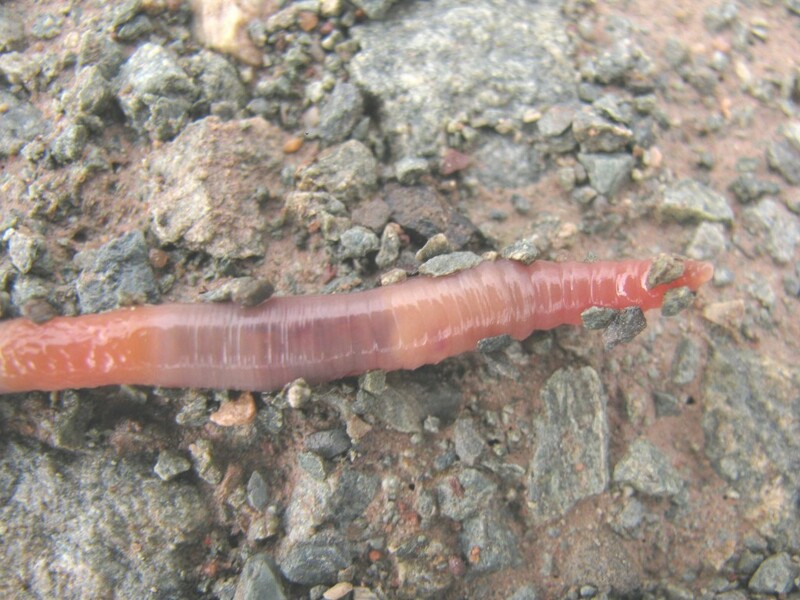 Dead earthworms formed pinkish squiggles among the stones of the road, and live ones pulled themselves forward with waves of muscular contractions that reminded me of a Slinky toy. I paused to photgraph one, its segmented body (defining characteristic of the invertebrate phylum Annelida) glistening with moisture, its skin stunningly beautiful in shades of opalescent, almost iridescent pink and purple. While gardening, I’d caught glimpses of that glistening oligochaete skin in other earthworms, but never before seen one so rivetingly beautiful. It was the gift of serendipity, a treasure found while seeking other beauty.